“Seek good, and not evil, that you may live; and so the LORD, the God of hosts, will be with you, as you have said. Hate evil, and love good, and establish justice in the gate; it may be that the LORD, the God of hosts, will be gracious to the remnant of Joseph” (Amos 5:14). It seems the greatest challenge with regard to Ash Wednesday and the observance of Lent is how to view this special day and season! Generations ago, Christians seemed clear about this as a time of repentance for the forgiveness of sins, as people saw self-denial as a primary way of reorienting one’s life from sin to righteousness. Today, even those of us within the western Christian tradition seem unsure how to approach Ash Wednesday and Lent. Many speak of it as a time to “take something on” rather than “give something up.” Some reject the idea of repentance and self-denial as too negative, too much of a “downer”; instead, they commit themselves to volunteering at a soup kitchen, helping at a homeless shelter, or serving in their community, so that their Lenten observance is more outwardly directed than inward. Certainly, there are many ways to observe Ash Wednesday and Lent. Our first reading from the lectionary for today, however, suggests a simple, straightforward approach that, while not first spoken about Lent, can be helpful to us. 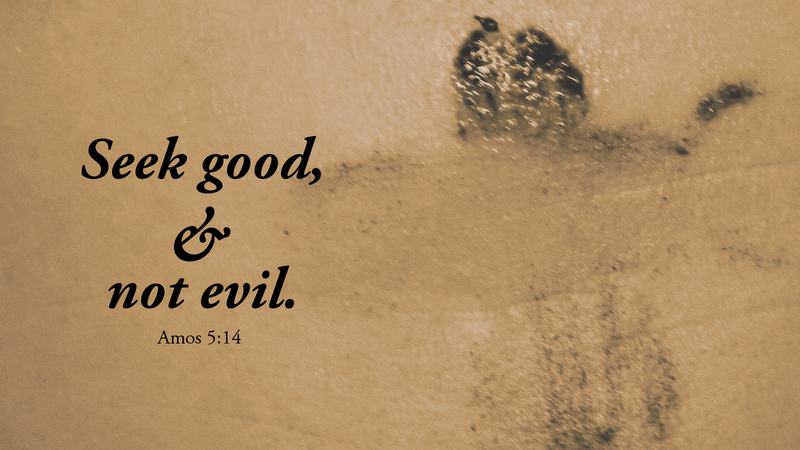 “Seek good, and not evil … hate evil and love good, and establish justice … that the LORD, the God of hosts, will be with you.” Might these exhortations shape and guide our Ash Wednesday and Lenten observance? In all that we do, whether inwardly or outwardly directed, might we seek only good and not evil—hating evil, loving good, establishing justice as we are able, to be in the presence of the LORD our God. This booklet of devotions is intended to provide us with the chance for a holy and devout Ash Wednesday and Lent. In addition to weekly worship and your own particular Lenten discipline, perhaps you will find this devotional book a help in our journey from ashes to Easter, as together we seek good and not evil. Prayer: Almighty God, help us to have a holy and devout Lent, committed to seeking good, not evil, that you will be with us always. Whatever our Lenten observance, let us keep our focus on these; through Christ our Lord. Amen.